Hailing from the Netherlands, Myrkvar return with their second full-length album. This folk Viking black metal band was born in 2004, when they also released their first demo. They signed a contract with the Belgian label Shiver Records, who released their very interesting debut album “Als Een Woeste Horde” in 2008. 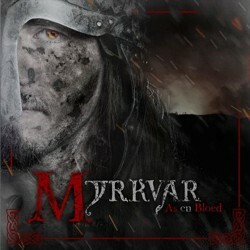 On April 2012, four years after the debut, Shiver Records presents the second full-length of Myrkvar, entitled “As En Bloed”. If you appreciated bands like early Finntroll, “As En Bloed” is an album you better check. Myrkvar have made a big effort and they improved their sound a lot. They have also shared the stage with many great bands of the genre, so they are much more experienced musicians. I hope they can get even better in the future. The album is released in a standard jewel case version with 12-page booklet, illustrated by Erik Wijnands (also Carach Angren). If you want to get a first taste of their music you can visit the links below. I know I enjoyed their music very much!